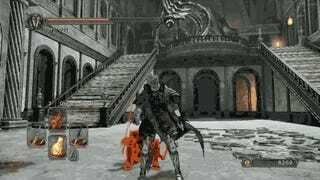 It isn't enough to kill your foe after a parry in Dark Souls II. In order to really make your opponent suffer, you have to embarrass the hell out of them before snuffing them out. Redpaint did just that while dueling, coming up with a series of hilarious and elaborate tricks to do after a parry. It's fantastic, next-level griefing that culminates in an amazing ending that's worth waiting for. To contact the author of this post, write to chrisperson@kotaku.com or find him on Twitter at @papapishu.